A golf club above Nueva Andalucia just north of the AP7 motorway. A fairly big clubhouse at the top of a valley. Extensive terrace with nice views. Service on the terrace is careful, although a bit slow. Parking is underground under the clubhouse. The surrounding area is quite built-up with mid-sized villas and apartments. This is not a club 'out in the countryside' unlike others on the Costa. The La Quinta club and its golf course is quite cramped, but still comfortable. There is a driving range just in front of the clubhouse with free range balls (nice touch – well done) although this is not long nor wide nor flat. More a range to do quick warm up with some irons than practice all the clubs in your bag. 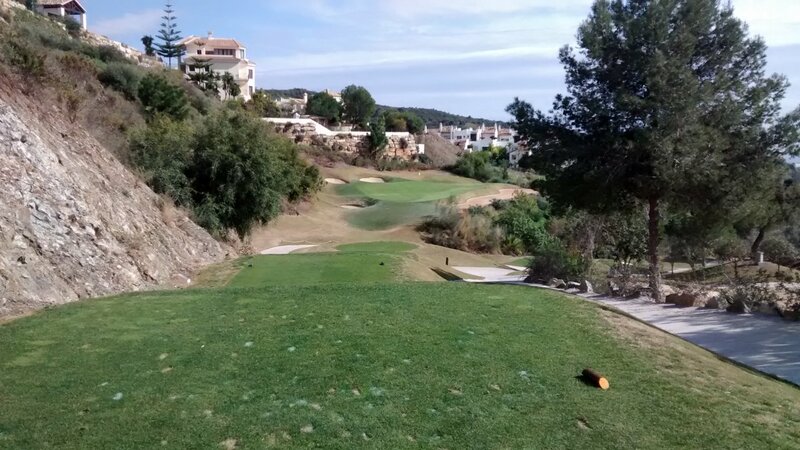 There are three 9-hole sections: A (called San Pedro), B (called Ronda) and C (called Guadaiza). These are lengths A = 2700 meters, B = 2450 meters, C = 2900 meters. So B is significantly shorter than A and C – and also shorter than the front or back 9 of the average 18-hole course down on the Costa. I have never played B, only the A+C combination. So this review only covers A (as the front 9) and C (as the back 9), but I hear that B is much like A. The front 9 is closely surrounded by property. Nothing really intrusive, but plenty of property directly overlooking the holes. The back 9 is more open and property is not close by. I think the back 9 nicer than the front 9 – bigger, more spacious, more diverse holes, simply more interesting – whereas the front 9 is a bit too cute and boxy for my taste. Most holes are bowl-shaped, so offline shots on the way up to the green tend to roll back towards the middle of the fairway. Fairways are medium width and open out immediately in front of the tee boxes. In other words there are few narrow angles off the tees. Not once playing this course did I feel I had to go down a club off the tee box for safety reasons. Tee boxes are excellent quality - deliberately planted with very fine grass. Fairway grass is good, but has a fair number of divots. It seems divots on the tee boxes are better repaired than divots on the fairways, which seems the wrong priority to me. The fairways have not much slope (across the fairway) or incline (along the fairway), despite the area being quite hilly. In other words, they laid out the golf course to be quite gentle rather than following the steep inclines of the landscape. La Quinta is old enough for all trees to be mature and this is generally a very pleasant course to look at. The greens are quite large and also generally flat - not much slope and no tiers. They are medium-paced and the grass there is high quality. Easy to get a reasonable result on approach shots and get down in two putts from most areas of the green. Green surrounds are small – up to only half a meter off the green – but good quality. Bunkers are also good quality and in average positions you expect e.g. guarding greens but not particularly difficult to avoid. There is water (quite large ponds) on a few holes, but not very tricky. Generally I think La Quinta is an easy course. Designed with a 20-handicap player in mind, not a 10-handicap player in mind. Good golfers off the yellow tees will have not much challenge to make greens in regulation and get down in par. Mid-handicap players will enjoy this course, although at par 71 find it quite a bit easier than similar level par 71 or par 72 courses on the Costa. 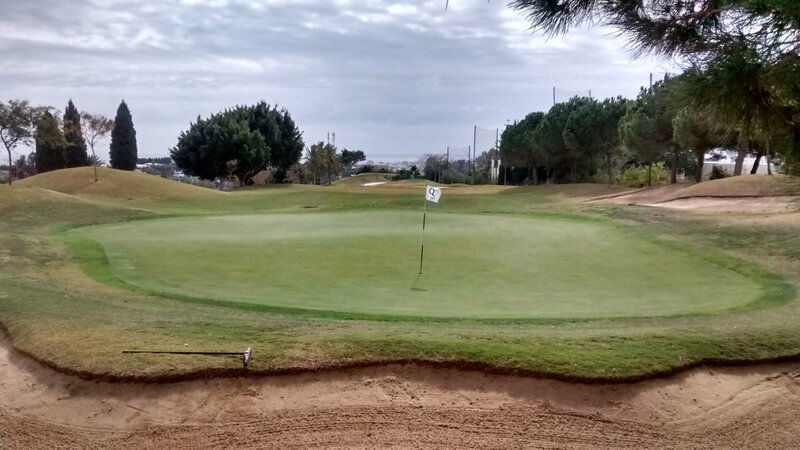 The course is definitely suitable for players with handicap in the 25-30 range. They should have little difficulty in staying safely on the fairways up to the greens. Even using a putter as an approach club from up to 5 meters off the green works well on this course. And high-handicap players can plan to play A+B rather than A+C if they are looking for a shorter course. The pricing at La Quinta has been a bit erratic. For example there was a time when the difference between the retail and wholesale price was way too big. By that I mean the price quoted directly over the phone for a 2-ball with buggy (the 'retail' price as I call it) was way higher than the equivalent price through a booking agent (who negotiate hard for the best 'wholesale' price based on the principle they will secure lots of bookings). I accept there is a differential price here – all clubs have it. But if the price difference is too large then golfers paying the full retail price think that unfair. Golf clubs should not try to be too clever with their pricing. Just offer a fair deal and a pleasant day on the course – then reasonable golfers will show up. There is no single element of this course I can criticize, although perhaps they could be doing a better ongoing job of repairing fairway divots. An easy course and recommended for medium-handicap and high-handicap players. A nice course to walk. Not a personal favourite course of mine. I expect the average golfer on this course is 20+ handicap. Play can be a bit slow. Review last updated: February 2015. Number of times played: 5. The 9-hole combination Guadaiza+Ronda is represented by the yellow dot. The 9-hole combination Guadaiza+SanPedro is represented by the brown dot. This basically confirms that the SanPedro 9-holes is significantly shorter than the other 9-hole options. 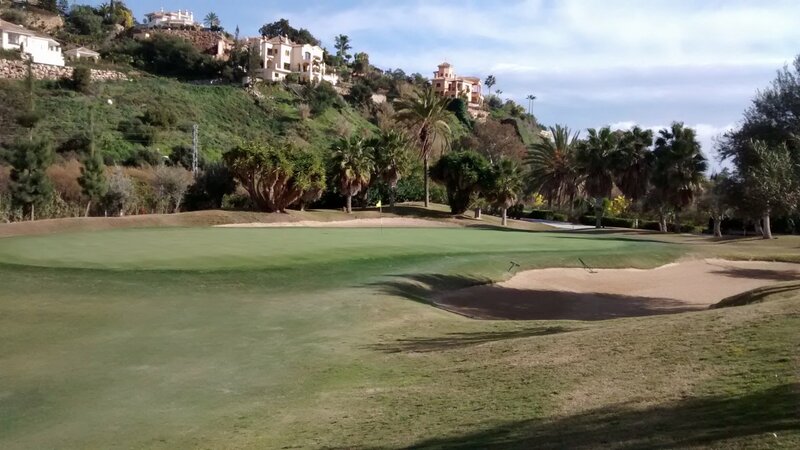 Whichever 9-hole combinations you play, the 18-hole course is about average difficulty compared to all other courses on the Costa del Sol. An 18-handicap player can expect to go around this course 19 or 20 over par.